makes mistakes. If you wish to discuss NTFS, or any other topic, you can email us here. Note: This page is still under construction . . . .
show how this data can actually be used! Our main reason for publishing these notes on NTFS, and indeed much of the information here at The Starman's Realm, is an attempt to alleviate some of the confusion in the forensic community (and others) caused by typo errors, inaccurate statements and even blunders regarding what is available online and in print concerning NT file systems and other relevant data. Furthermore, we believe in using real-world data examples in order to explain a topic. Simply learning 'terminology' or listening to or reading someone's words as they attempt to teach a complex subject can keep many from truly understanding. Definition of "File" and "File System"
A file on a computer drive is essentially an artificial container for holding some kind of information. A file's boundaries (within a larger container often called a volume) are kept track of by its file system. A file system (NTFS being one of a few well-known types; including FAT32 and ext4) must, of course, also store that boundary information (and any other associated data; such as a file's name and when it was created) somewhere on the same disk drive. Metadata refers to data that provides information about other data. In the physical world, the old 'index cards' of a library that could be used to find a book on its shelves (according to the Dewey Decimal, LC or some other classification) also contained a great deal of metadata about each book: The book's author, when it was published, by what printing house(s), how many pages that edition had, etc. etc. A 'list of lists' is another example of metatdata. Metadata is most often found in a structured format which allows one to more easily retrieve some sought after data or to manage data resources. 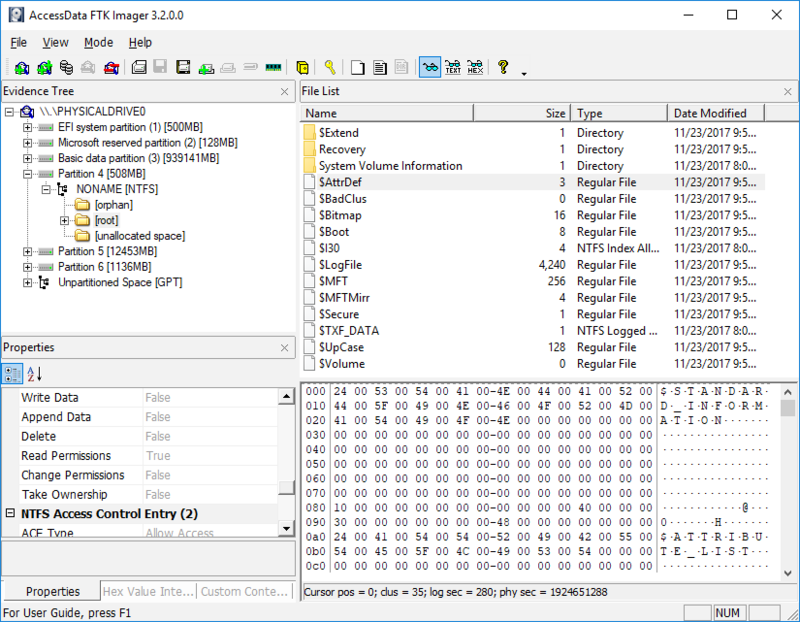 NTFS stores this metadata within the same volume its files are found; primarily as entries in index files and the MFT (Master File Table; see below). 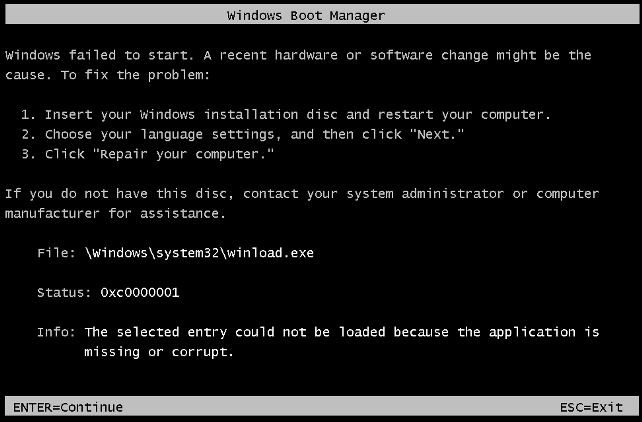 Even the NTFS Boot Record is a File! In fact, even the 16 sectors of an NTFS partition's Volume Boot Record (or VBR); which always begins at Logical Sector zero (0), is a meta file under NTFS (its file name is: $Boot). file or a $test folder in your C: drive's Root Directory. The Examples 2 box above shows a Windows 2000 or later OS will always return File Not Found for these NTFS metafiles. The fact that a user cannot create these particular files in the Root Directory shows they do exist there; even if you cannot see them. So what exactly keeps the average user from ever seeing these files? The answer is the code in NTFS.SYS. 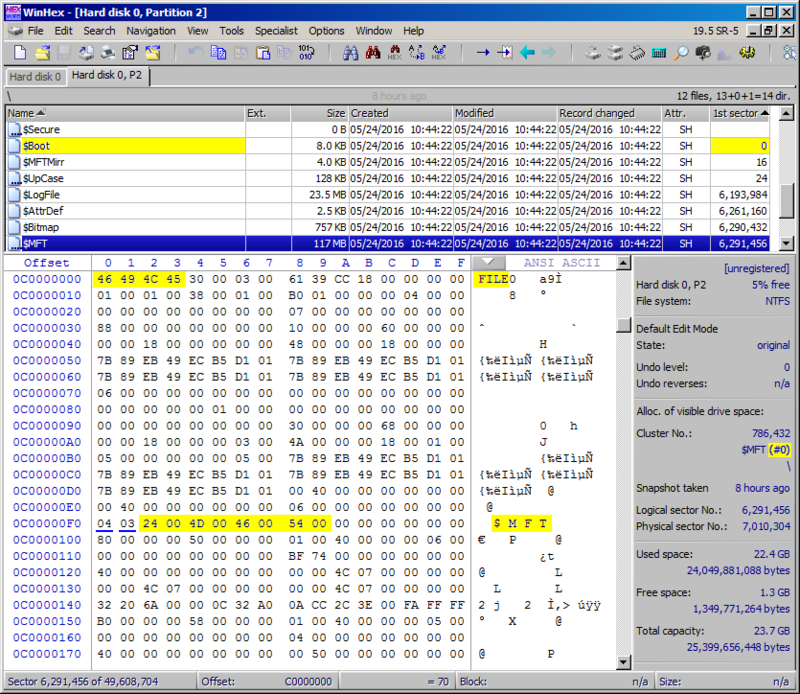 Only a disk editor such as WinHex or some other forensic tool designed to do so, will allow you to easily view these files. One could of course search for and view the 'raw' bytes of these metafiles using the free hex and disk editor HxD, but that would require both the necessary experience and more time to find them. 1) We point out again that the $Boot file always begins at Logical Sector 0 of the volume / partition. 2) The first 4 bytes of every MFT record entry should always be the ASCII characters: "FILE". 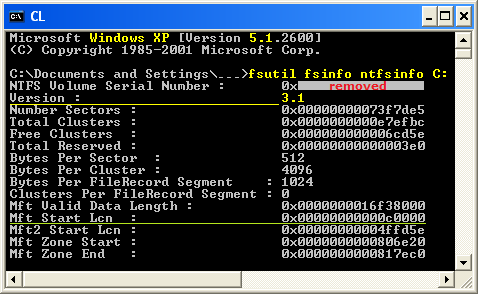 Note: If the 5th byte (offset 0x04) is 0x30; an ASCII "0" character, then the file records are for NTFS version 3.1 (Windows XP or later), but a 0x2A here (an asterisk * character) would indicate the records are for a Windows 2000 or earlier NT OS. 3) When viewing the $MFT file, WinHex shows the record/entry number in focus; note the "(#0)" next to the $MFT file name (in the dark gray area of the display). This indicates the user is viewing the very first record entry of the $MFT file. 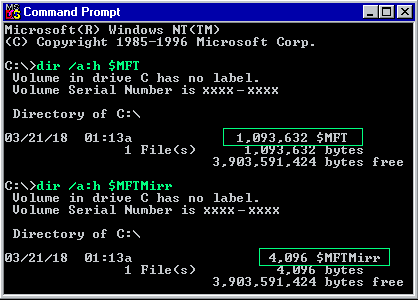 4) For every file (or directory) entry in the MFT, its Microsoft Unicode name technically begins 2 bytes preceding or ahead of its printable characters: For example, in the display above, where the $MFT name begins at offset 0xF2, the byte at offset 0xF0 (a 04 in this case) indicates the length of the name; and since it uses only a single byte for its length, that means no Windows NTFS file name can be longer than 255 characters (0xFF = 255). The second byte (a "03") indicates the type of name. It should also be noted that the location of a file name within each MFT record is not always the same! For example, both the $AttrDef and the Root Directory file names in our sample MFT records (see below), begin at offset 0xD8 in MFT record numbers 4 and 5 (see Table 2 below for the file names of the first 16 MFT records): "08 03 24 00 41 00 74 00 74 00 72 00 44 00 65 00 66 00 ..$.A.t.t.r.D.e.f." and "01 03 2E 00 ...." (the actual name within the MFT for the Root Directory being a single 'dot' or period; hex: 0x2E with no $-sign in front of it, though other works sometimes list it that way). Nor will it always be the same location in different volumes for the same record: For example, in the $MFT file on a different drive, we found its Root folder name ('. '; 0x2E) at offset 0x138. In fact, when the contents of an MFT record changes (which happen every time a file is modified or simply read), any number of its attributes may have their locations shifted within that record. Since 7-Zip is a compression and archival tool, it may surprise many that it can also be used to view the metafile names in an NT volume's Root Directory provided it's not the volume the Windows OS is currently running on. 1) Open the 7-Zip File Manager. If you cannot open a volume that is not your C: drive, you'll need to make sure there are no running processes accessing that volume. We would recommend using 7-zip immediately after first booting-up your PC. 4) It will take some time for 7-Zip to "Open" all the files in the volume. Figure 2. This display clearly shows the MFT file name of a Hidden, System, Directory as being only '.' (the 'Root Directory'). However, it must be pointed out that unlike WinHex, 7-Zip can not provide any data about the metafiles which exist only inside the MFT (the ones shown with '0' bytes file size in the display above). But it's still quite useful for quickly viewing what metafiles do exist in a volume and inside of a metafile folder; such as "$Extend". 6) To view the contents of any of these typical NTFS Metafiles, an application will need to be selected (we'd recommend HxD). Unfortunately, the latest Windows 10 updates have become so strict in regards to protecting these files, it is no longer possible to even view their contents using 7-zip! install has file version numbers: 4.0.13x1.x, 5.00.2195.xxxx and 5.1.2600.x, respectively. But these numbers are indicative of the OS version, not the NT file system version. First, note that (except for NTFS v.1.0 and 1.1 volumes) the last sector of an NTFS partition is always reserved for a copy of the volume's Boot Sector (often referred to as the Backup Boot Sector). Everything is a file in an NTFS volume, but there is no entry in the MFT for the BBS (Backup Boot Sector), because it is outside of the NTFS volume. So, an NTFS Volume is always 1 sector less than its partition: SizeOf_NTFS_Partition - (1 sector) = SizeOf_NTFS_Volume. This is also true for NTFS volumes on GUID Partition Table (GPT) disks. Starting Cluster Number of the $MFT file in this partition. Starting Cluster Number of the $MFTMirr file in this partition. The bytes with a violet background are error messages used by the boot code. The last two bytes of any Boot Sector are always 55 AA (also written as the hex number: 0xAA55). 0170:  A1 FA 01 E8 03 00 F4 EB FD 8B F0 AC 3C 00 74 09  ............<.t. So, even with the bloated size of a Windows 10™ OS, though our test PCs never lost the location of the $MFTMirr file, none of them were able to repair the issues; even after re-booting and selecting various repair options using the install DVD! For all of their touted advancements over the years, you would think Microsoft could have attempted to use the Backup Boot Sector's data; especially if the $MFT file's starting location was completely zeroed-out (making it the same location as the Boot Sector; which it obviously could never be in that location! ), but it appears the Microsoft policy makers decided very long ago to not become involved in actual data recovery. They likely determined: It would be better for user's to have a technician examine their data issues and decide what to do, rather than us spending more money and wasting time on writing software that needs to make so many critical decisions about customer's data. 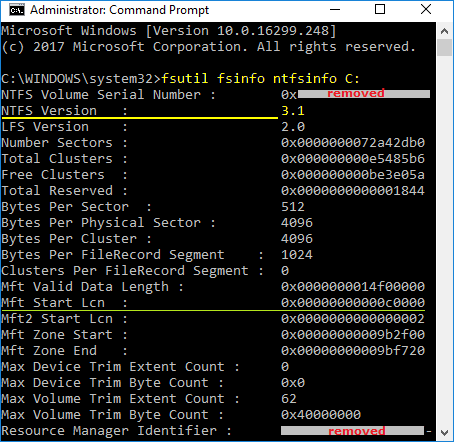 How Large is an NTFS Cluster? Few today will ever encounter an NTFS Cluster that is not 4 KiB (4096 bytes), since the exceptions are: 1) When working with an NT 3.1 through NT 4.0 install volume, because those partitions always began as FAT16 and were converted to NTFS after using the FAT16 default cluster sizes, 2) Because NTFS volumes under 2 GiB; even for Windows 2000 and Windows XP, did in fact have smaller cluster sizes [We will be adding detailed notes on this in the near future!] and 3) The next change in the default cluster size is for volumes over 16 TiB (it defaults to 8 KiB). The beginning of NTFS (Betas and Windows NT 3.1), Windows NT 3.51, Windows NT 4.0 (and its Service Packs 1 - 6), all of their Server and Advanced Server versions and the NT 5.0 Betas which became Windows 2000 (and its SP1 - SP4). Windows XP (and SP1 - SP3), Windows Server 2003 (and SP1, SP2 and R2; R='Release', there was no R1) and Windows Vista (both the 32-bit and 64-bit versions). Windows 7 (including its 32-bit version), Windows 8 and 8.1 and Windows 10; as well as the various Server 2008, Server 2012 and Server 2016 versions. NOTE: The three diagrams below (Figures 3 through 5) are not to scale; which means the size of the boxes used for the VBR, $MFT, Mft2, BBS and the whole partition are not in true proportion to each other. The VBR and BBS are, respectively, only 8192 and 512 bytes, and Mft2 is only 4096 bytes long. The size of the $MFT file will vary. If we attempted to show these areas to scale, some of the boxes couldn't be a single pixel wide even for a rather small partition. 1) Under Windows operating systems of the first era, the beginning of the $MFT file is found either immediately after or near to (relatively speaking) the Volume Boot Record (VBR). When an unformatted drive area had a new NTFS volume created under the early systems (NT 3.1, 3.5, 3.51 and their Servers), the $MFT file was placed in clusters immediately following the VBR. This is why much of the literature concerning the NT File System shows the MFT at the beginning of a volume. For Windows NT 4.0 and 2000, it's normal to find a gap of 16 sectors between the VBR and $MFT. On the OS install volumes from this era, we have seen the $MFT begin at Logical Sectors ranging from only 32 to 202,915 (this is the largest 'gap' from the VBR we found; it's possible a larger one exists). It should also be noted that no matter where the $MFT file began, the $MFTMirr file was created in the center of the volume. 2) With the release of Windows XP, although the $MFTMirr file was still being created in the center of its volumes, the $MFT file began to appear in a specific location: At LCN (Logical Cluster Number) 786,432 (or 0x0C0000 in hex). So, what happens if I create a volume that is very close to or even smaller than LCN 786,432? NOTE: For any volume which has simply been 'expanded,' such as the Windows XP C: volume shown in Figure 2a above (we manually altered its partition table entry and the data in its VBR to expand its volume), the "Mft2" ($MFTMirr file) will no longer be at the center of the volume. Mft Start Lcn : 0x00000000000c0000 and Mft2 Start Lcn: 0x0000000000000002. NOTE: The locations for the $MFT and $MFTMirr (or "Mft2") files as described in all three of the NTFS Era Layouts above are for partitions and volumes that have not been altered by 3rd-party partition or defragmenting tools (a worthwhile third-party tool can in fact move the location of both these files), nor by the Windows OS itself (Vista or later); which has limited Shrink and Expand capabilities: Windows can "Shrink" NTFS volumes to the point where Mft2 ($MFTMirr file), or in the case of an Era 3 volume, the $MFT file, end up being at the end of a volume, since the Microsoft Shrink feature cannot move either one of these files from their original location. It may be true that Windows Shrink will not move some or all of the other NTFS metafiles as well. Thus, the reason Era 2 partitions, with the $MFTMirr file located in the middle of the volume, cannot be shrunk by Windows Disk Management more than about half (1/2) of their original size! The $MFT, $MFTMirr, $LogFile and $Volume records. Among other data, contains the volume's name. The Attribute Definition Table. See Attributes. Contains an index of all the files and folders in the Root Directory. after all, everything in the NT File System is a file. Allocation status of every cluster on the Volume. 16 sectors always reserved; boot code size is only about half that. Listing of all 'bad clusters' on the volume. These 4 records are reserved by the file system. Their function(s) are unknown at this time. Actual Size of this FILE Record. Allocated Size of this FILE Record; normally 0x400 (1 KiB; 2 sectors). There are some sample $MFT files here for the first 17 records; in both binary and text format as well as an HTML color-highlighted disk editor view! These are from a Windows XP Professional OS and a Windows 2000 Professional OS installation on real physical disk drives; the XP install includes a BAAD record. Note: ID # 0xF0 is not defined at this time. 1[Return to Text] For example, The Complete Guide to Windows Server 2008, John Savill (Pearson Education, 2008), which was invaluable to many admins working with this server, still had this error (on the 2nd page of Chapter 5): "The MFT2 is a mirror of the first 16 records of the MFT, which describe the metadata files themselves and are, therefore, most vital." Well, that number (16) is incorrect. $MFTMirr is a copy of only the first 4 records of the MFT. Whoever wrote '16' probably was thinking about the fact the first 16 records of the MFT are always the same metafile records; and (expected?) that all 16 should be copied. But no one has seen a Microsoft $MFTMirr that does, even on a Windows 2008 Server. Microsoft® documentation has had its share of errors which, unfortunately, continue to be perpetuated by students copying the errors into their projects! One example, which also influenced trojan and malware authors can be found using the Google search terms: "how ntfs works" "server 2003" "ntldlr.dll" site:microsoft.com (keep the quote marks around the first 3 terms). Then look for ntldlr.dll on that page. Well, there is no such Windows OS file as ntldr.dll! The file's name is only: ntldr (it has no .dll extension). Some malware authors saw this and used the name for malicious code (variations on other real system file names have also been used many times for trojans and other malware). So, just because you see something in IBM®, Microsoft® or some other large software and/or hardware company's documentation does not mean it must be correct; verify it first. 2[Return to Text] "Systems" plural, because both the linux community and Apple® developers along with a number of commercial software houses like Paragon Technologie GmbH and Tuxera, each have their own versions of NTFS drivers for many different OSs; all of which may be helpful in understanding and/or implementing successful NTFS drivers, but not necessarily true of Microsoft® drivers. For example, one can read about NTFS-3G here and various versions of Apple's NTFS drivers here. But, the main focus of this page will be on verifiable data concerning the NTFS versions of Microsoft® Windows™. on the size of an NTFS metafile. be used under Windows XP. 4[Return to Text] The NTFS.SYS File System Driver contains the names of all the "$-character" system files and treats them as specially Protected files, returning ACCESS DENIED to any system code (such as Windows File Explorer) acting on behalf of users or even Administrators which simply attempts to view their names. So these hidden, system NT metafiles can never be listed in the Windows Root Directory, even at a Command Prompt; let alone be accessed for reading. This means any tool (possibly apart from Microsoft's own utilities; like fsutil) that does view these special files, must be accessing these files and their content outside of the usual OS code which would normally call NTFS.SYS to access an NTFS file. It should be NOTED that the "BAAD" indicator can also (though rarely) be found at the beginning of some MFT record which has become 'corrupt' due to some strange behavior of the PC, its OS or by someone purposely altering system bytes within that MFT record. We're searching for sites that provide examples of what a Windows OS will do with such MFT entries. For an additional reference, see the "BAAD" entry in the "Glossary" of the work NTFS Documentation by Richard Russon and Yuval Fledel, which states that during a chkdsk run, "if [it] finds a multi-sector item (MFT, INDEX BLOCK, etc) where the multi-sector header doesn't match the values at the end of the sector, it marks the item with the magic number 'BAAD', and fill [sic] it with zeroes (except for a short at the end of each sector...)" In this quote, we take "short" to mean a USN (Update Sequence Number); which is indeed found at the end of each MFT redord's sectors as well as at the beginning of the Update Sequence Array (see MFT Header Layout for more information on USNs and the USA). It is unfortunate that few, if any, other works, contain these details concerning "BAAD" records due to 'bad sectors' on a disk drive. 8[Return to Text] The name types are: 01 - Indicates a LONG filename, 02 - Indicates a SHORT filename, 03 - Indicates a LONG filename that also meets the requirements for a SHORT filename. 9[Return to Text] 7-Zip happens to be one of the best free 'Windows' programs available on the Net (in our opinion). We have not only used it to extract files and compress them into the standard archives (BZ, GZ, TAR, ZIP and of course 7z), but also extract both files and data from proprietary archives, emails and whole file systems! (Examples: Not only archives such as: ARJ, RAR, Microsoft CAB files, but also file systems and system related data: Apple™ DMG, Linux EXT and SquashFS, ISOs, UDFs, FAT, HFS, NTFS, GPT and UEFI drives and image files, Microsoft CHM, MSI, VHD and WIM files, and more.). 7-zip is one of our go to tools when trying to view whatever is inside some obscured data, quickly! You can download the free (GNU licensed) 7-zip from here. 10[Return to Text] John Savill, The Complete Guide to Windows Server 2008 (Pearson Education, 2008), Chapter 5, 2nd page. This author may have also had in mind all the other versions of NTFS as mentioned in our note 2 above. 11[Return to Text] For the Windows NT 3.1 (NTFS v. 1.0) through Windows NT 3.51 (v. 1.1) OS versions, we do find copies of their NTFS "Boot Sector" in the middle of the volume, immediately preceding the $MFTMirr file. Furthermore, the $Boot (MFT #7) entries actually reference this cluster in a "2nd run" of the "Run List" in the MFT record's $DATA (0x80) attribute! The "1st run" is a link to the full 16-sector Boot Record at the beginning of each volume. 12[Return to Text] Our opinion here is based on the fact that both IBM and MS-DOS had backup copies of the FAT table for their FAT16 and FAT32 file systems, but none of their DOS ever made use of those, and now many decades later, neither do any of the Windows operating systems make use of their backup boot sectors. In all fairness, Microsoft did publish some 'knowledge base' pages on how such data could be used; though it was mostly useful for data recovery technicians rather than the average user. See: How to Recover From a Corrupt NTFS Boot Sector (KB-121517) and Recovering NTFS boot sector on NTFS partitions (KB-153973). 13[Return to Text] These lists do not include 'Embedded Devices', cancelled versions, such as, Nashville, NepTune or Odyssey, nor any Appliances or Mobile devices. See: List of Microsoft Windows Versions and its links for a complete list of all Windows versions and editions. 15[Return to Text] Curiously, for volumes having 4 KiB clusters, an LCN of 0x0C0000 (4 zeros) is also a logical byte-offset of 0xC0000000 (7 zeros) bytes, so don't confuse, or be confused by, the two values; this is only a coincidence. (Well, sort of... A 4 KiB; i.e., a 4096-byte, cluster is 0x1000 bytes in hex, so it's easy to see why multiplying LCN 0xC0,000 by 0x1000 bytes/cluster = 0xC0,000,000 bytes). Updated: 30 JAN 2018 (30.01.2018); 3 FEB 2018 (03.02.2018); 5 FEB 2018 (05.02.2018); 6 FEB 2018 (06.02.2018); 7 FEB 2018 (07.02.2018); 11 FEB 2018 (11.02.2018); 12 FEB 2018 (12.02.2018); 17 FEB 2018 (17.02.2018); 19 FEB 2018 (19.02.2018); 23 FEB 2018 (23.02.2018); 5 MAR 2018 (05.03.2018); 6 MAR 2018 (06.03.2018); 9 MAR 2018 (09.03.2018); 11 MAR 2018 (11.03.2018); 21 MAR 2018 (21.03.2018); 5 APR 2018 (05.04.2018); 19 APR 2018 (19.04.2018); 26 APR 2018 (26.04.2018); 3 JUN 2018 (03.06.2018); 27 NOV 2018 (27.11.2018); 30 NOV 2018. Last Update: December 3, 2018 (03.12.2018).